Other Places with the "Idaho Stop"
Colorado has passed Legislation allowing individual cities to make their own rules. So Far a few cities have already adopted the Idaho Stop. Colorado now allows individual cities to enact such laws. So Far Breckenrigde, Aspen and Dillion have passed "Stop as Yield" laws. Summit county also passed a "Stop as YIeld Law. 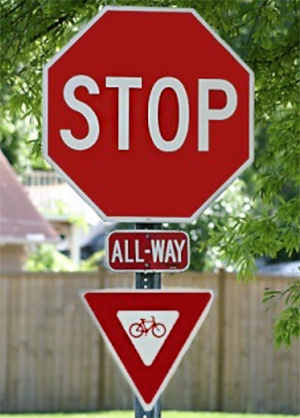 Delaware has their own version called the "Delaware Yield"
In 2018 in Utah, a bicycling measure that would allow cyclists to treat stop signs as yield signs and red lights as stop signs came close to passing. It passed in the House by 58-11 vote! And it cleared the Senate transportation committee, but the legislative session ended before it got to a final vote in the Senate.